Like in the West, there are thousands of young kids in every small town and big city with dreams of being a "rockstar". There is MTV and other music TV shows in Japan, and kids have grown up hearing and seeing the most popular mainstream artists from Japan and abroad. Most domestic Japanese indie music is in the idol, pop, rock, hard rock, metal, punk, hiphop/rap, folk/roots, singer/songwriter, and electro/techno/house genres. Most of the instruments and gear used today come from Japanese companies such as Yamaha, Roland, Korg, and many others. All the music instrument shops have the latest domestic and foreign gear and software on display and to try out. There are plenty of music schools to teach drums, guitar, bass, synths, singing, and even stage presence. As the "indie" route is becoming more popular in Japan, more schools are offering courses on the music business and the DIY (do-it-yourself) process. Clothing shops and hair salons cater to appearances. Whatever genre, Japanese can sound and look like pros. You often see kids with soft guitar cases on their backs on trains, bikes and on the streets. Many can play their instruments like the masters by the time they are in high school. However, due to strict school and parental rules, high school kids cannot really go out and gig at night (but like all teenagers, they sometimes break rules). They are left to perform in their high school talent show or cultural festival, or some weekend talent contest sponsored by Yamaha or such. By the time they've finished high school they have to get a "real" job and some will abandon their "rockstar" dreams while others will continue in indie bands at night after work. They will play gigs at "live houses", sell tickets, their CD's and merchandise at their gigs. Those who are serious will relocate to Tokyo to play at more "live houses" or even on the street. Bands breakup and new ones form from their scattered members. And some bands and artists will find success....Sound familiar? It's not much different than other countries except the numbers are more in Japan. Subsequently, infrastructure (online communities, support, distribution, rights management/administration) has been set up for indie artists and record labels. Now indies can access distribution and administer music rights just like the major record companies. There are hundreds of music schools and rehearsal studios often run by Japanese musical instrument makers and retailers. There are fans and musicians of all genres of music in Japan. Enjoy the videos below of Japanese indie musicians! Every year the record labels and production companies hold auditions or accept demos. Talented indie bands and artists with a good demo, show and workable image (you must send in photos) may get "signed". However with the larger record/production companies in Japan, "signed" means you become an employee of the company and they pay you a nice salary (plus bonuses) for several years. There is little or no negotiation. But this is the way it has been done in Japan. Many things are standardized in Japan to make society run smoothly and life easier. (Even price-fixing for music products is common at all levels. That's why in Japan import CD's are cheaper than domestic onesbut that's another story). The company takes care of you as long as you do what they want. This is a dream for many Japanese kids. There are over a million foreigners who are permanent residents in Japan. Recently, record labels run by foreigners who reside in Japan have emerged. Many are bringing in the music they already know and love from their home countries. Some labels are fledgling startups with little experience and resources to be profitable while some have become relatively successful. Whether run by Japanese or foreigners, these record labels will either license, import or P&D music from foreign artists. Typically the record labels in Japan that deal with foreign artists have at least one person who can communicate in English. Companies will offer licensing and P&D deals when it is cheaper to press domstically rather than import/ship your products to Japan. Actually most prefer to P&D so it allows them to make a CD/record with Japanese cover and liner notesa very important feature for both the shops and music consumers (see image). Imagine shopping for something written in a foreign language! Many retail CD shops have closed throughout Japan. The flagship HMV store in Shibuya, Tokyo closed its doors forever recently. There are only a few large retail music stores left. Mainly small specialty CD and vinyl record shops will actually carry an inventory (i.e. a handful) of indie products. Most have to be specially ordered by the customer. Any indie music shop can order a CD wholesale from the distributor who can have it sent to any place in Japan within 24 hours (Japan is about the size of California State and has a vast, cheap and efficient next-day delivery system). Naturally, if there are a lot of requests by customers for a certain product, a store may put it on its shelves. Larger record companies/labels employ an army of retail shop promoters whose job is to encourage retail shops to put the products of their company on shelves. Smaller record labels usually have nobody or only 1 or 2 people to do this type of work. Click here to learn how to get distribution in Japan. Nowadays, in Japan, indie record labels are also "distributors" because they can tap into the indie distribution network and get your music into the main internet, mobile and retail CD shops (not usually on shelves but for online and special orders) like the major record companies. In actuality there is another middleman or aggregator that also takes a cut, but as long as you're OK with the cut the record label is offering you then it doesn't matter. You can expect to get 35% to 50% of net sales (wholesale price) when you are under a Japanese record label/distributor. If you manage to get a good deal with a record label in Japan that will get your music in all the main music shops in Japan and who will actually pay for significant promotion, then that is great. If you know your record label is small with limited financial resources to devote to you, try to cooperate and offer to contribute to some of the promotion expenses like print/online advertising, or airfare for a tour (but also try to negotiate a higher share of sales). Traditionally, in Japan you were either a "pro" (i.e. "signed" to a record company) or an "amateur" (i.e. not an "employee" of a record company). Today, "amateur" has been replaced with the word and concept of "indie". 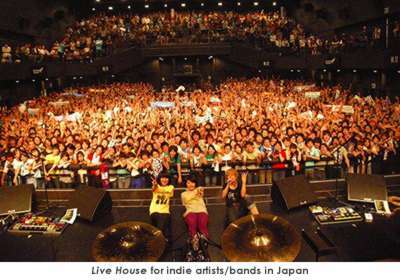 The indie scene is booming in Japan with new distribution, sales, and rights administration systems set up especially for indie bands/artists and record labels. Some indie artists can make a living playing at "live houses" and selling CD's, downloads and merchandise. Successful indie artists have sold over 100,000 units. Though uncommon, some have sold over 1 million units. These indie artists have gone on to sign with major labels and enjoy a high level of success, leading some major labels to focus increased efforts on scouting indie artists (and labels) for new talent. The record companies are always scouting for foreign and domestic talent but most can only take on 1 or 2 new artists per year. This leaves many foreign indie artists and bands no option but to take a DIY approach at selling and promoting their music in Japan. As the focus shifts to digital music sales, new systems are being established to help indie artists get digital distribution in Japan. These systems can also be used by foreign artists. Many foreign artists and record labels have found Japan to be a very receptive environment and a valuable source of music revenues. *As a side note...Some of you may find your CD already in the catalogs of some Japanese shops even though nobody has informed you. Some of these shops simply buy the wholesale price CD's from CDBaby or Super D and then resell them at their physical store and/or on their website. This shows you that there are people who think your music can sell in Japan. So you should definitely pursue the market further. If it is one or several Japanese customers who have purchased the full retail price CD then you know for sure you should be more serious about the Japanese market. Don't let this revenue opportunity pass by because the life of music products and bands is short.